In its June 2017 issue, The Art Bulletin is publishing reviews of six online collection catalogs issued by the National Gallery of Art, Washington DC; the Seattle Art Museum; the Arthur M. Sackler and Freer Gallery of Art, Washington DC; the Art Institute of Chicago; the Tate, United Kingdom; and the Walker Art Center, Minneapolis. This is the first time the quarterly journal has devoted its reviews section to digital scholarship. 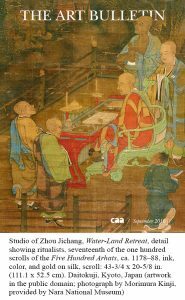 Stephen H. Whiteman’s review of the Seattle Art Museum’s Chinese Painting & Calligraphy catalog is available now in an enhanced digital version, published on the Scalar platform and developed in collaboration with Nancy Um and Lauren Cesiro. The open-access project is at http://scalar.usc.edu/works/samosci/index. A few weeks ago we unveiled a new website design at CAA and today we present another new change. This time, it’s arriving to your mailbox. If you are a subscriber of The Art Bulletin, you may notice that the March 2017 issue looks different. Thanks to the hard work of Nina Athanassoglou-Kallmyer, editor-in-chief of the publication; designer Katy Homans; the Art Bulletin Editorial Board; copublisher Taylor & Francis; and CAA publications staff, the newly redesigned Art Bulletin has arrived. It was a project almost two years in the making and we owe a great thanks to the Samuel H. Kress Foundation for financially supporting the project. Founded in 1913, The Art Bulletin remains one of the most respected publications for peer-reviewed scholarly articles and critical reviews in all areas and periods of the history of art. The redesign updates the publication for contemporary readers with a full-bleed cover, single-column page layout that emphasizes legibility, and a more flexible format for featuring larger article images. We hope you enjoy the new look of The Art Bulletin. To read digital issues of The Art Bulletin or Art Journal, visit Taylor & Francis online. The Art Bulletin Editorial Board invites nominations and self-nominations for the position of reviews editor for the term July 1, 2018–June 30, 2021 (with service as incoming reviews editor designate 2017–18). The Art Bulletin, published quarterly by CAA, features leading scholarship in the English language in all aspects of art history as practiced in the academy, museums, and other institutions. The reviews editor is responsible for commissioning all book and exhibition reviews in The Art Bulletin. He or she selects books and exhibitions for review, commissions reviewers, and determines the appropriate length and character of reviews. The reviews editor also works with authors and CAA’s editorial director in the development and preparation of review manuscripts for publication. He or she is expected to keep abreast of newly published and important books and recent exhibitions in the fields of art history, criticism, theory, visual studies, and museum publishing. This is a three-year term, which includes membership on the Art Bulletin Editorial Board. The reviews editor attends the three annual meetings of the Art Bulletin Editorial Board—held in the spring and fall by teleconference or in New York, and in February at the CAA Annual Conference—and submits an annual report to CAA’s Board of Directors. CAA may reimburse the reviews editor for travel and lodging expenses for the meetings in New York in accordance with its travel policy, but he or she pays these expenses to attend the annual conference. Candidates must be current CAA members in good standing and should not be serving on the editorial board of a competitive journal or on another CAA editorial board or committee. CAA encourages applications from colleagues who will contribute to the diversity of perspectives on the Art Bulletin Editorial Board and who will engage actively with conversations about the discipline’s engagements with differences of culture, religion, nationality, race, gender, sexuality, and access. Nominators should ascertain their nominee’s willingness to serve before submitting a name; self-nominations are also welcome. Please send a statement describing your interest in and qualifications for appointment, CV, and at least one letter of recommendation to: Art Bulletin Reviews Editor Search, College Art Association, 50 Broadway, 21st Floor, New York, NY 10004; or email the documents or inquiries to Joe Hannan, CAA editorial director. Deadline: Monday, April 3, 2017. Finalists will be interviewed on the afternoon of Friday, May 5, in New York. CAA invites nominations and self-nominations for three individuals to serve on the Art Bulletin Editorial Board for a four-year term, July 1, 2017–June 30, 2021. The ideal candidate has published substantially in the field and may be an academic, museum-based, or independent scholar; institutional affiliation is not required. The Art Bulletin features leading scholarship in the English language in all aspects of art history as practiced in the academy, museums, and other institutions. The editorial board advises the Art Bulletin editor-in-chief and assists her or him in seeking authors, articles, and other content for the journal; performs peer review and recommends peer reviewers; may propose new initiatives for the journal; and may support fundraising efforts on the journal’s behalf. Members also assist the editor-in-chief to keep abreast of trends and issues in the field by attending and reporting on sessions at the CAA Annual Conference and other academic conferences, symposia, and events in their fields. Candidates must be current CAA members in good standing and should not be serving on the editorial board of a competitive journal or on another CAA editorial board or committee. Members may not publish their own work in the journal during the term of service. CAA encourages applications from colleagues who will contribute to the diversity of perspectives on the Art Bulletin Editorial Board and who will engage actively with conversations about the discipline’s engagements with differences of culture, religion, nationality, race, gender, sexuality, and access. Nominators should ascertain their nominee’s willingness to serve before submitting a name; self-nominations are also welcome. Please send a letter describing your interest in and qualifications for appointment, a CV, and your contact information to: Chair, Art Bulletin Editorial Board, College Art Association, 50 Broadway, 21st Floor, New York, NY 10004; or email the documents or inquiries to Joe Hannan, CAA editorial director. Deadline: April 17, 2017. 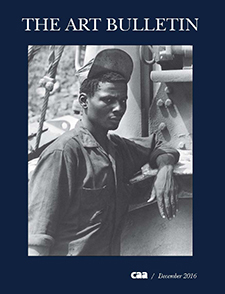 A young Ghanaian man photographed by Paul Strand in 1963 peers intently from the cover of the December 2016 issue of The Art Bulletin. Mark Crinson’s essay analyzes the American photographer’s book Ghana as a conflicted attempt to represent postcolonial nationhood. 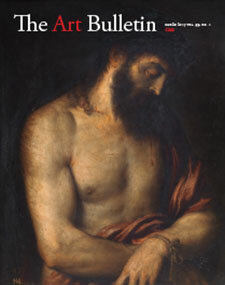 In other essays featured in the issue, Michalis Olympios reassesses the Renaissance art of Venetian Crete in light of local Gothic traditions and adaptations of northern European models; Susannah Rutherglen defines a genre of Venetian Renaissance painting that treats interior doors and shutters as sites of artistic innovation; Ruth S. Noyes finds that Mattheus Greuter’s engravings for Galileo’s controversial publication on sunspots argue a case too provocative to articulate in the text; and Harper Montgomery surveys the work of the Guatemalan artist and critic Carlos Mérida, a cosmopolitan who worked in the 1920s to incorporate indigenous Maya culture into the transnational production and display of modern art. The reviews section, on the theme of “Subjects Framed and Reframed,” takes aim at early photography. It includes reviews of recent books on Eadweard Muybridge’s nudes, photographs of the abolitionist Sojourner Truth, a European commercial photographer in 1870s Yokohama, and portrait photography in the Arab world of the late nineteenth century. CAA sends print copies of The Art Bulletin to all institutional members and to those individuals who choose to receive the journal as a benefit of membership. The digital version at Taylor & Francis Online is currently available to all CAA individual members regardless of their print subscription choice. Boris Charmatz’s If Tate Modern Was Musée de la Danse? (May 15–16, 2015) is the focus of a new multimedia review on the Scalar platform, If caa.reviews were performance.reviews?. Organized by Juliet Bellow, the project includes an introduction by Bellow, and three reviews of the performances at the Tate Modern by Arabella Stanger, Nicole Zee, and Tamara Tomic-Vajagic. 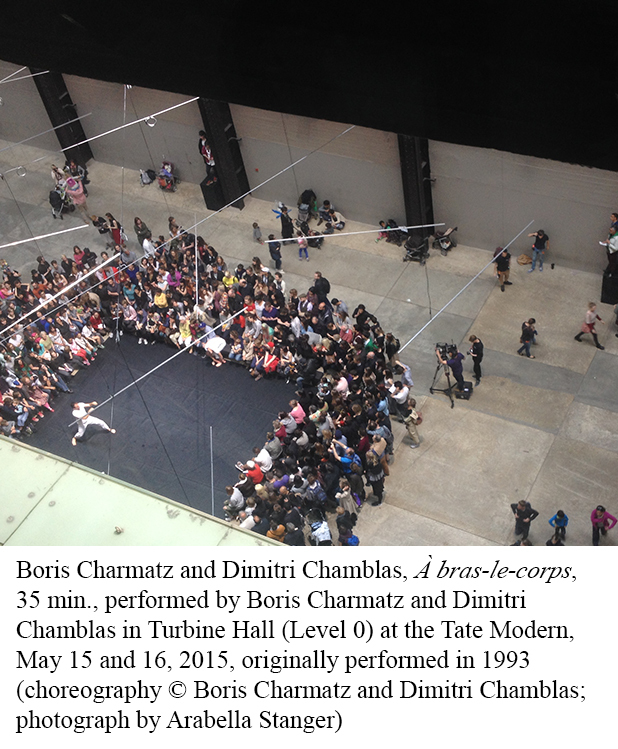 The review presents the complexities of Charmatz’s transformation of the Tate Modern into a museum of dance for two days and features an interactive map showing where the performances occurred in the Tate Modern, in addition to videos and still images. Charmatz’s project challenges conceptions of museums as institutional spaces and incorporates audience participation and “unauthorized” performances. This review is part of a new caa.reviews initiative to review time-based media works. Art Journal Open this summer launched a new cluster of conversations featuring artist residencies, with artists who have participated in residencies interviewed by those who organize these programs. Through the conversations, Art Journal Open examines how residencies operate logistically and conceptually, and how they contribute to creative production. Conversations published in the series include Caitlin Masley-Chalet of Guttenberg Arts (Guttenberg, NJ) with artist Diana Shpungin, Vanessa Kauffman of Headlands Center for the Arts (Sausalito, CA) with artist Patricia Fernández Carcedo, and Amy Cancelmo of Root Division (San Francisco, CA) with artist Kija Lucas. Earlier this summer, Art Journal Open published the third of a three-part series on appropriation as an artistic strategy: “Knight’s Heritage: Karl Haendel and the Legacy of Appropriation, Episode Three, 2013” by Natilee Harren, with a response by Nate Harrison. 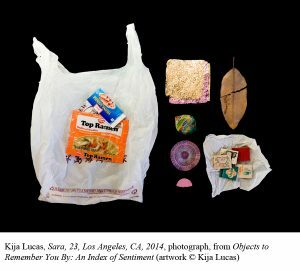 Recent features also include a review of Wetware: Art, Agency, Animation (Beall Center for Art + Technology, University of California, Irvine, February 6–May 7, 2016) by Charissa Terranova, and “Humans Have Been Human for So Long,” a dialogue between artist Shana Lutker and curator Mika Yoshitake on Lutker’s exhibition Shana Lutker: Le “NEW” Monocle, Chapters 1–3 at the Hirshhorn Museum and Sculpture Garden in Washington, DC (October 27, 2015–February 16, 2016). The forthcoming Fall 2016 Art Journal features a project by the artist Penelope Vlassopoulou, whose source material is the phrases and drawings carved in underground cells by detainees during the Nazi occupation of Greece. In other feature articles, Mario Merz’s fascination with the Fibonacci series is the cruz of Elizabeth Mangini’s examination of works created within the intellectual and political ferment of 1960s Italy, and Emily Hage rethinks Romare Bearden’s historical and political position in relation to the dense collages he made for the covers of Time and Fortune. The Reviews section includes Eve Meltzer’s account of the film Eva Hesse and reviews of books by Thomas Crow, Claire Robins, and Joan Kee. An annotated bibliography by Roger F. Malina, the astrophysicist who also serves as executive editor of Leonardo Publications/MIT Press, explores the highly productive intersections of art and science. 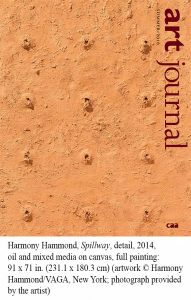 Recently published in the Summer 2016 Art Journal is a project by the renowned artist Harmony Hammond. The covers of the journal were given a waxy coating to convey the nature of her intensely tactile paintings and prints, featured in a twenty-page portfolio. In the features, Amanda Jane Graham takes a close look at the interweaving of domestic and performing spaces in Trisha Brown’s 1975 dance Locus; Mechtild Widrich investigates the effects on the urban fabric of the new/old National Gallery of Singapore, created from a colonial-era court building; and Dan Adler traces the idea of an all-pervasive Apparatus in 1980s and 1990s works by the German photographer Thomas Ruff. The Reviews section begins with Chris Taylor’s examination of the film Troublemakers: The Story of Land Art. Other reviews examine a new book by Chika Okeke-Agulu and the exhibition and catalogue Hippie Modernism. An annotated bibliography by Audra Wolowiec explores the poetics of sound and language. The cover of the September 2016 issue of The Art Bulletin depicts Buddhist monks evoking ghosts in a nocturnal ceremony; the large detail from a polychrome silk scroll accompanies Phillip E. Bloom’s essay on twelfth-century Chinese paintings of Buddhist rituals. In other essays featured in the September issue, Judy Sund reconsiders nineteenth-century perceptions of Watteau’s Pierrot character as forlorn, Christine I. Ho contextualizes a brush-and-ink painting created by a collective in the early People’s Republic of China, and James Nisbet surveys intersections of global politics and imaging in the site-specific art of Walter De Maria. In his “Whither Art History?” essay, Bárbaro Martínez-Ruiz explores Kongo visual and cultural practices in contemporary art. The Reviews section, with a theme of “Urban Images, Memories, and Fragments,” includes four reviews of recent books on the cultures of fifth-century BCE Athens, seven Dutch cities from 1200 to 1700, early modern Rome, and Mexico City in light of Aztec civilization. In addition to their print subscription(s), CAA members receive online access to current and back issues of Art Journal and The Art Bulletin. Taylor & Francis, CAA’s publishing partner, also provides complimentary online access to Word and Image, Digital Creativity, and Public Art Dialogue for CAA members. To access these journals, please log into your account at collegeart.org and click the link to the CAA Online Publications Platform on Taylor & Francis Online. A grotesquely anthropomorphic hound standing on powerful back legs and blowing a stylized trumpet graces the cover of the June 2016 issue of The Art Bulletin. The etching is one of two dozen similar works by the early seventeenth-century artist Christopher Jamnitzer that Madeleine C. Viljoen explores in relation to early modern cosmography. The June issue also presents the first publication of an extraordinary eleventh-century enamel cup from a nomad’s grave in Ukraine, which Warren T. Woodfin examines in the context of other Middle Byzantine works with secular imagery. 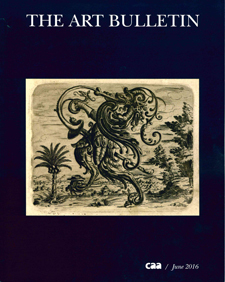 In addition, the issue features essays by David Young Kim on the multiple functions served by the carpets in Lorenzo Lotto’s paintings, and by Jean H. Duffy on issues of genre and perception in Jean Dubuffet’s mixed-genre spectacle Coucou Bazar. Shao Yiyang’s “Whither Art History?” essay reflects on the flourishing of art history in contemporary China. The reviews section, with a theme of “Cosmopolitan Art Worlds,” includes six reviews of recent books on art in Renaissance Italy, late nineteenth-century Shanghai, turn-of-the-century Paris, modern India, contemporary Brazil and Japan, and twentieth-century Nigeria. CAA sends print copies of The Art Bulletin to all institutional members and to those individuals who choose to receive the journal as a benefit of membership. The digital version at Taylor & Francis Online is currently available to all CAA individual members regardless of their subscription choice.